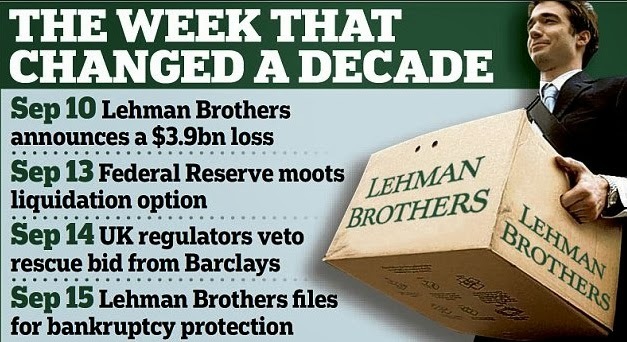 Lehman Brothers. Part 3. 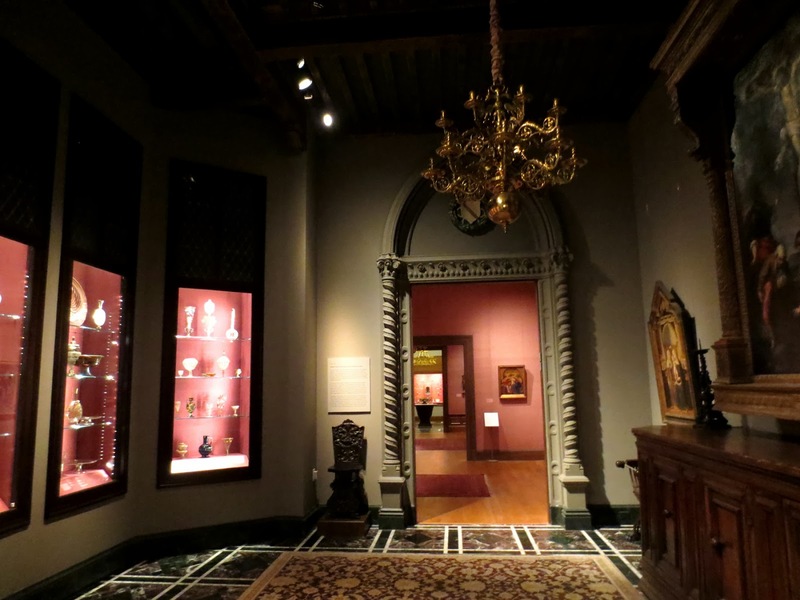 The house and art collection at Met Museum. 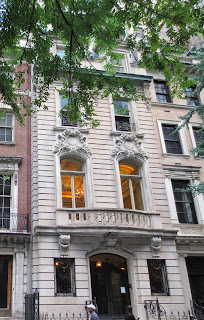 No.7 on the north side of West 54th Street in the fashionable upscale Upper East Side of Manhattan was built in 1900, on the place where St Luke hospital was. This 4-story limestone house was built for Philip Lehman, who was the son of one of the founders of “Lehman Brothers” corporation and its first chairman. 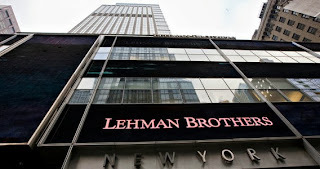 I wrote about “Lehman brothers” in my old posts ( post 1 and post 2). Today the Lehman House is one in a row of five surviving turn-of-the-century residences. 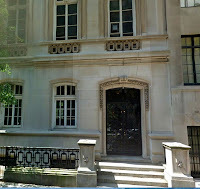 Among his neighbors was Moses Allen Starr, a neurologist who had worked with Sigmund Freud ( 5 West 54) and James Junius Goodwin, a banker and a cousin of J. Pierpont Morgan ( double lot 9-11 West 54). The young John D. Rockefeller Jr. moved into 13 West 54th in 1901. 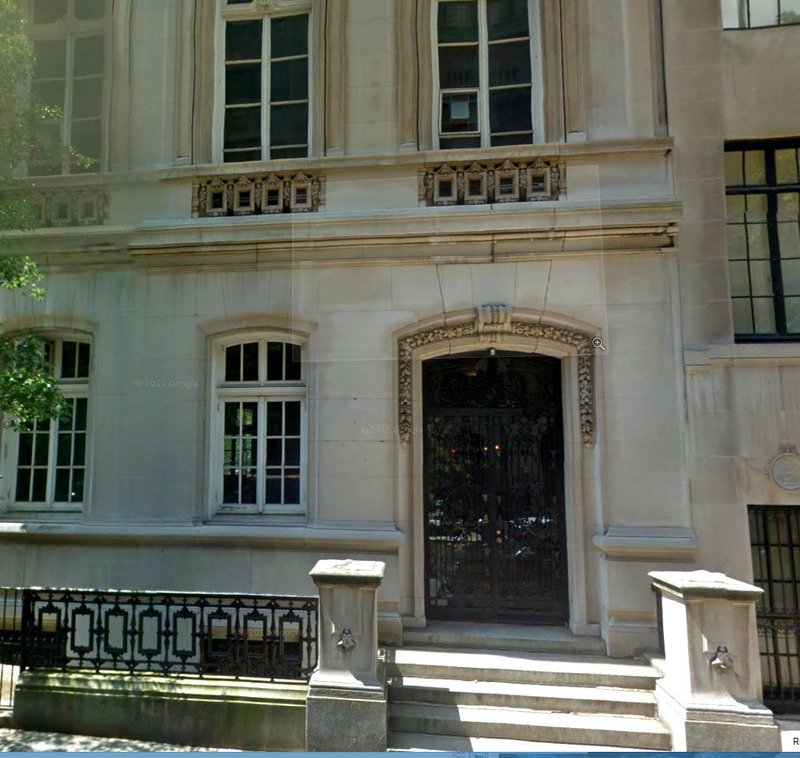 In this house Nelson Rockefeller died of a heart attack in 1979. Philip and his wife Cariie had only one son Robert - he inherited the mansion. Robert wrote that his parents went to Europe every year and bought pictures, tapestries and furniture. They bought what they liked and they knew what they want. Robert succeeded his father as the head of Lehman Brothers and expanded his art collection. 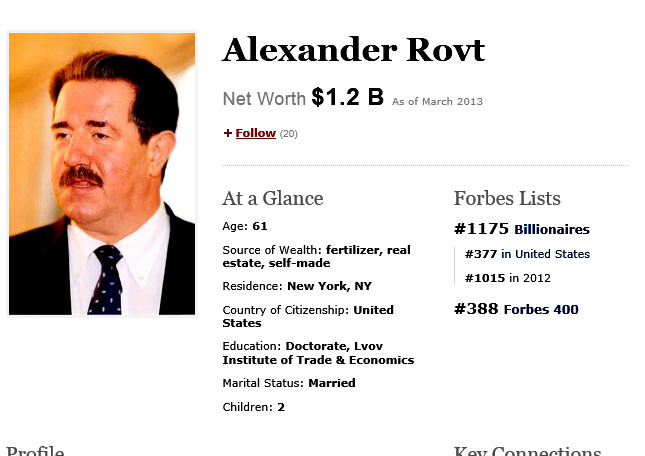 Robert was one of the wealthiest people in the United States. For six decades he built upon an art collection begun by his father in 1911. In 1957 nearly three hundred works were used for a solo exhibit at the Louvre Museum in Paris. 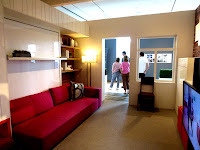 Robert converted his house into private gallery. In 1962 the house was opened to the public for New York Times called “one of the last great privately held art collections in the world.” The entrance fee was very high -$25 and was donated to the Institute of Fine Arts. The price of the movie ticket in 1962 was 50 cents. After Robert death in 1969 Lehman Foundation donated Lehman collection the Metropolitan museum of Art in New York. 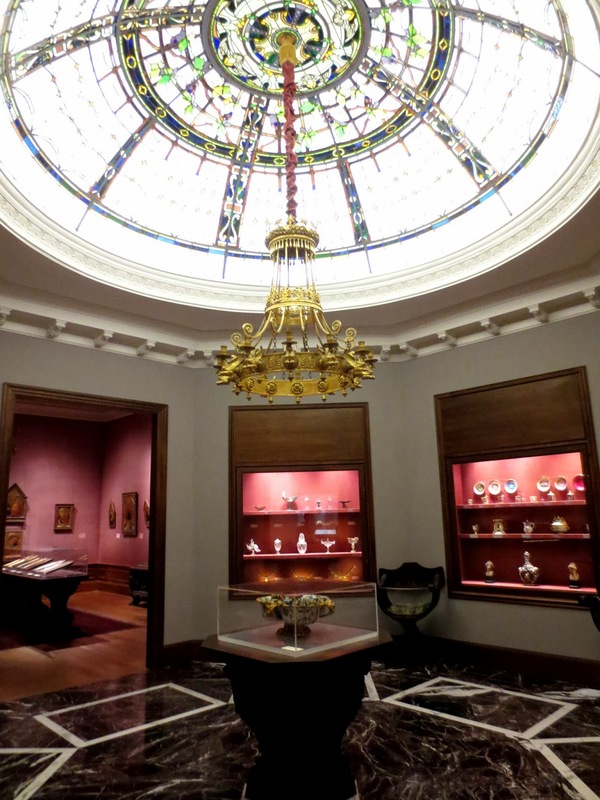 Collection includes more than 2,600 paintings, sculptures, glass, textiles, a enamels, and precious jeweled objects and is one of the most extensive and exceptional collections in the United States. A new wing was erected in the museum to display the collection. 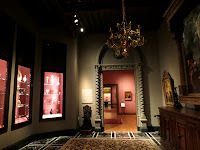 The Robert Lehman Wing includes a central gallery surrounded by a series of rooms intended to recreate the Lehman family residence. 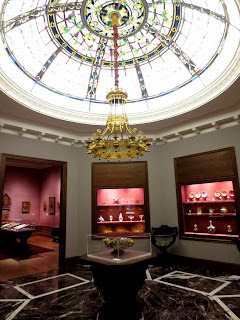 One of the rooms in the gallery is crowned by a stained-glass dome that originally formed a skylight in the Lehman home. 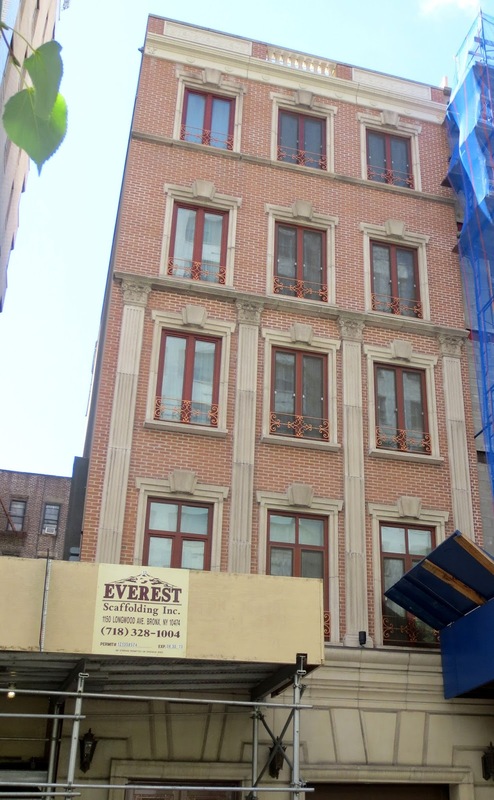 The Lehman House was purchased by the 7 West 54th Street Realty Corp. in 1974 and went through a series of owners until 2006 when it was purchased by Zimmer Lucas Partners for renovation into offices and entertaining spaces. 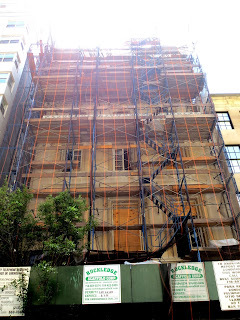 The architects restored the limestone façade and built a modern glass penthouse addition, invisible from the street. The Metropolitan Museum returned architectural artifacts which the museum was holding in storage and allowed the firm to take casts of other architectural details for replication purposes. 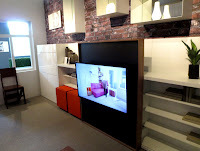 You can fid a virtual tour of the property here. 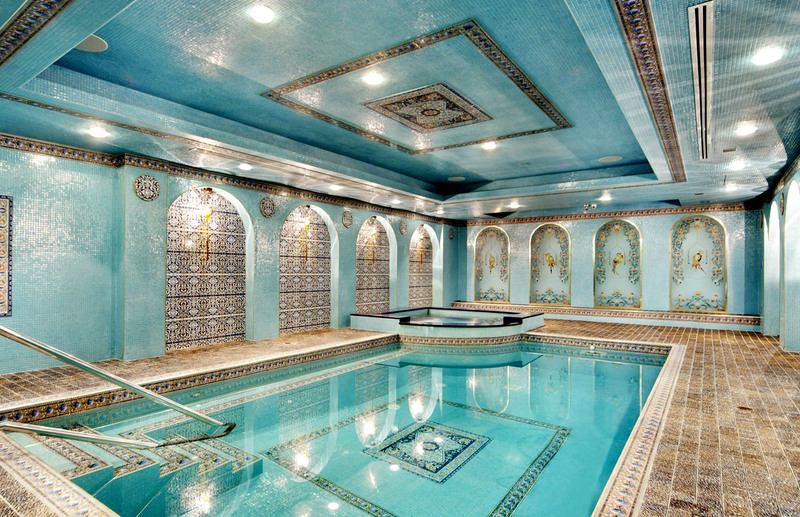 The house was on sale in 2012 for whopping $65 million. 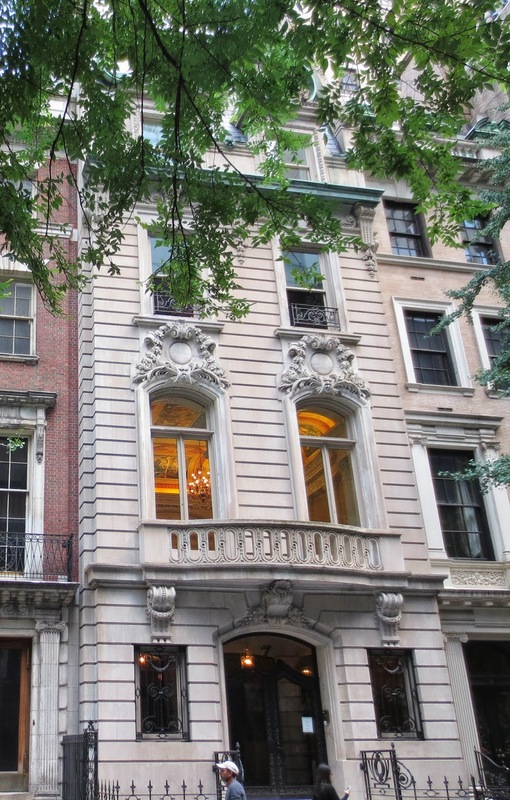 It is listed now for $49mln by Corcoran. 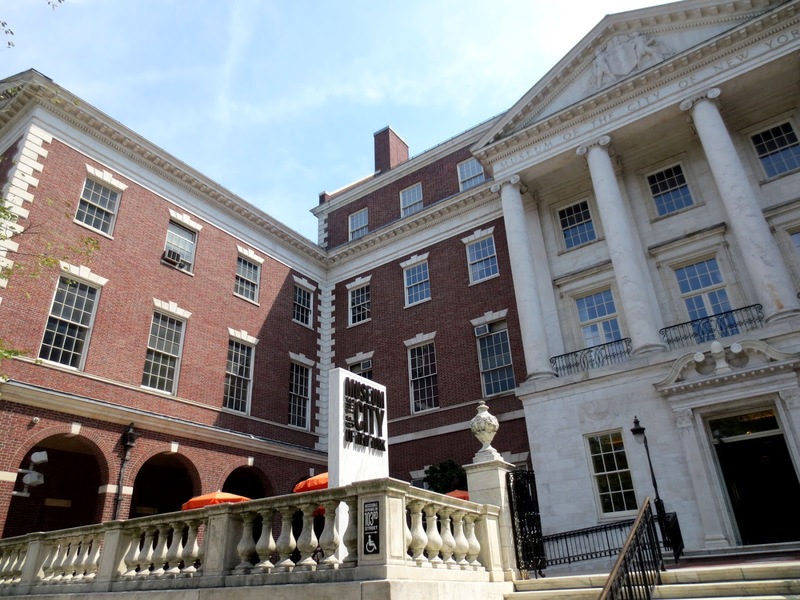 On June 24 The real Deal reported that the house had a buyer, and it is the most expensive townhouse contract signed so far this year. Five years ago, September 15 Lehman Brothers, the fourth largest investment bank in the world, filed for bankruptcy, officially kicking off the financial crisis. It was the largest bankruptcy in history -- larger than General Motors, Washington Mutual, Enron, and Worldcom combined. 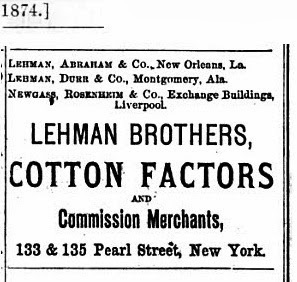 I wrote about the history of Lehman Brothers corporation in my old post. 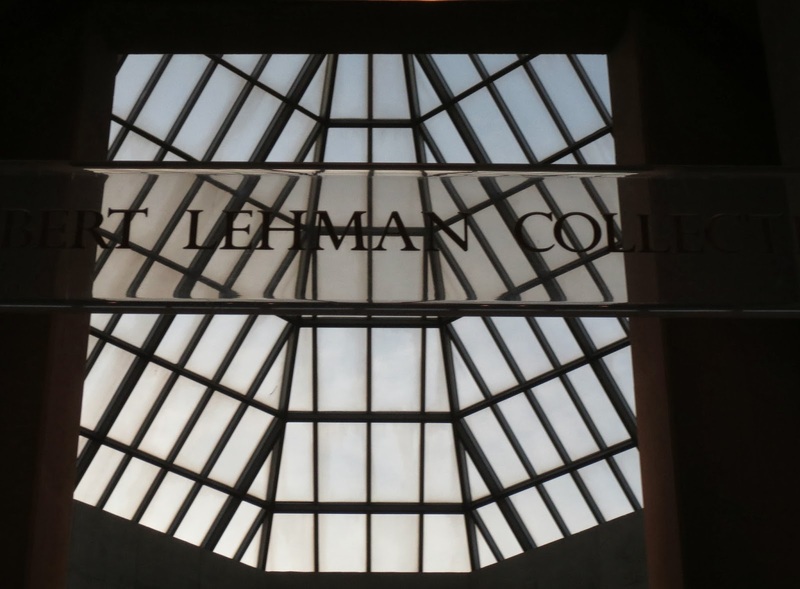 In 2000, Lehman celebrated its 150th anniversary . On September 11, 2001, Lehman occupied three floors of One World Trade Center. One of its employees was killed in the terrorist attacks of that day. Its global headquarters in Three World Financial Center were severely damaged and rendered unusable by falling debris, displacing over 6,500 employees. Trading operations moved across the Hudson River to its Jersey City, New Jersey, facilities, where an impromptu trading floor was built in a hotel and brought online less than forty-eight hours after the attacks. The investment-banking division converted the first-floor lounges, restaurants, and all 665 guestrooms on 51 floors of the Sheraton Manhattan Hotel near Times Square (811 7th Avenue, New York, NY) into office space. The hotel was built in 1962 as The Americana of New York to serve the huge number of tourists that the 1964 New York World's Fair would bring. In October 2001, Lehman purchased a 32-story, 1,050,000-square-foot (98,000 m2) office building for a reported sum of $700 million. 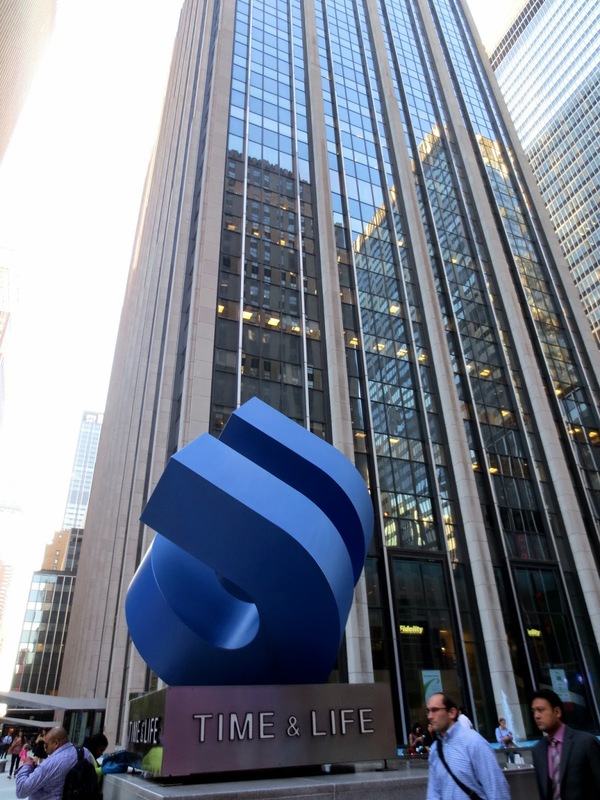 The building, located at 745 Seventh Avenue, had recently been completed, and not yet occupied, by Morgan Stanley. Five years ago on September 15, 2008 Lehman Brothers filed for Chapter 11 bankruptcy protection. The Dow Jones closed down 4.4% on September 15, 2008, at the time the largest drop by points in a single day since the days following 9-11. The Lehman Brothers collapse was the largest bankruptcy filing in U.S. history . It was the beginning of the global financial crisis and was a major catalyst of the financial meltdown. The domino effect began that day. It's not just that exports to the United States shrunken after September 2008; the flow of goods everywhere, in all directions, has fallen. 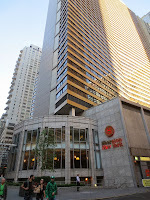 The fall of the company affected the President election. There were two distinct phases of the fall presidential campaign in 2008 pre- and post-Lehman. The collapse of Lehman Brothers made it easier for the Obama campaign to frame the election as a referendum on the Bush administration. 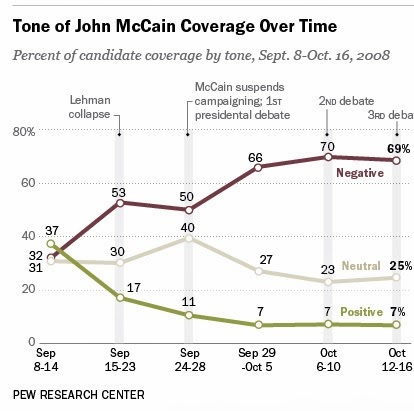 According to Pew Research Center, data analyzing the tone and focus of media coverage through the final stretch of that election showed how that coverage shifted dramatically in mid-September 2008 to focus on the financial crisis and the media narrative grew increasingly critical of Republican candidate John McCain. 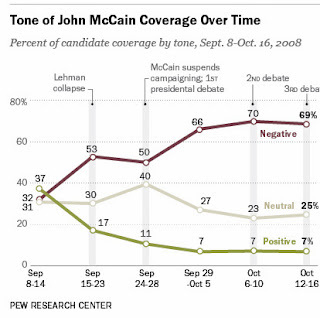 From Sept. 8-14, 37% of campaign narrative focused on the senator was positive in tone, while 32% was negative (another 31% was neutral).In the period immediately following the Lehman bankruptcy, Sept. 15-23, the tone of his coverage grew much harsher: Only 17% was positive compared with 53% negative and 30% neutral. The former Lehman Brothers building in Times Square in New York has become the Barclays Capital building for the British multinational banking and financial services company. The Lehman slogan “where vision gets built.” disappeared from the lighted screens as has the Lehman name. 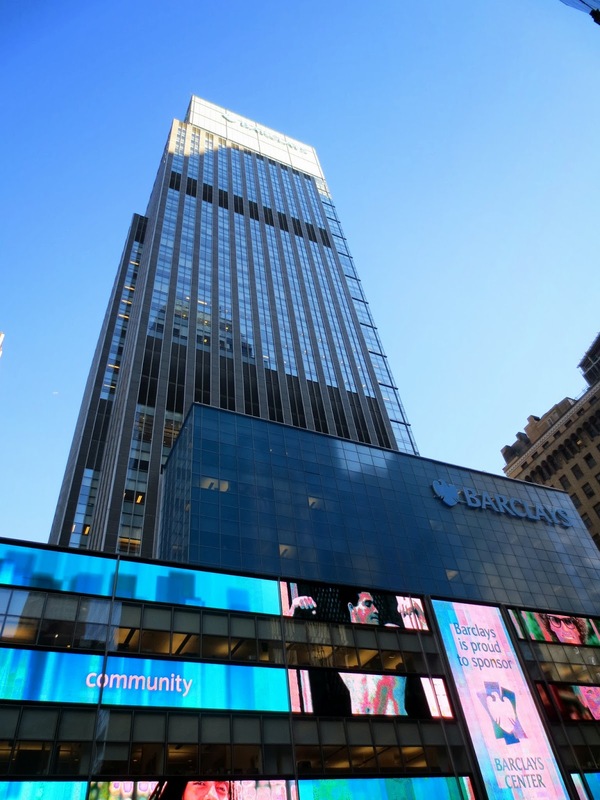 The Lehman deal doubled Barclays' investment banking headcount: Some 10,000 Lehman workers transitioned to Barclays in early 2009, though a third being were laid off right away. 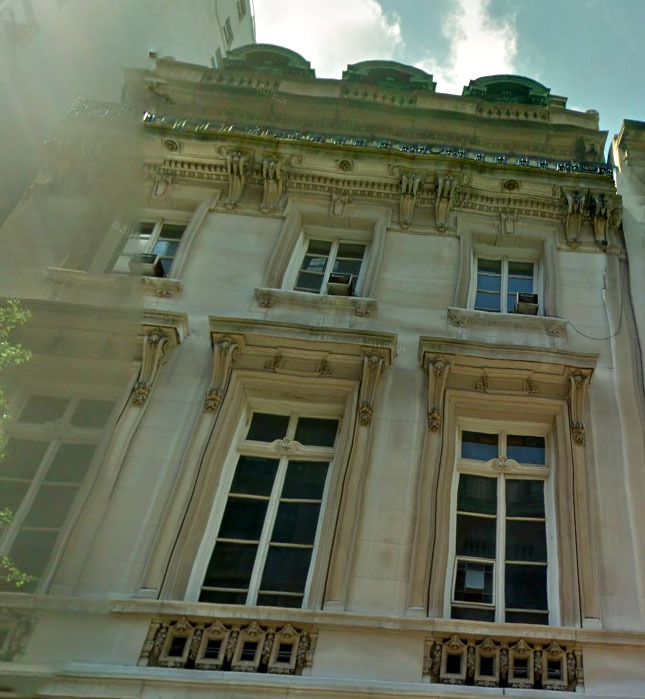 JP Morgan moved into 25 Bank Street, London, the former home of Lehman Brothers. The building was being sold to JP Morgan for $770 million. 14 Wall Street skyscraper (29 floors) sits across Broad Street from Federal Hall. It is not the first skyscraper occupying this lot. 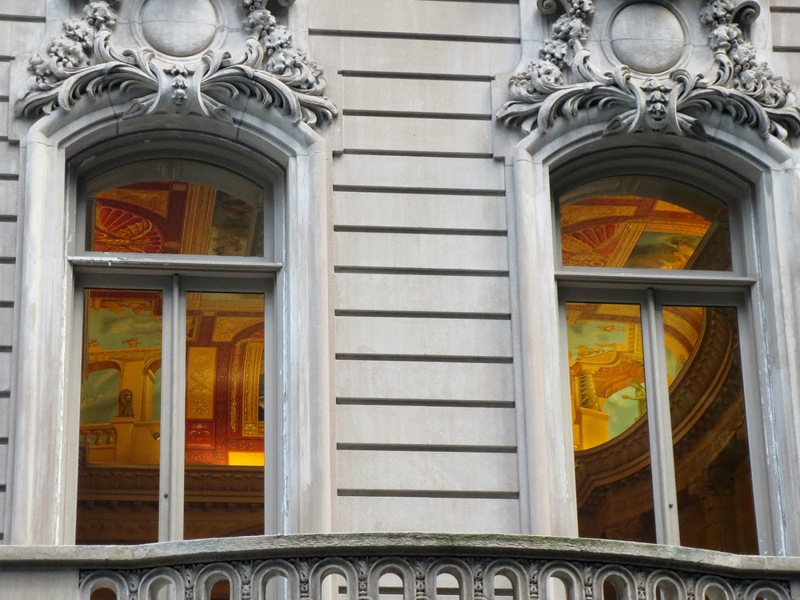 The first one was a 20-story Gillender Building, named after millionaire Eccles Gillender. 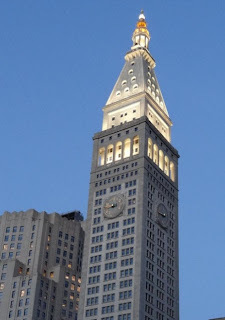 The building was completed 1897 and was one of the eighth tallest structures in New York. It was named "one of the wonders of the city" and was demolished in 13 years, in 1910. 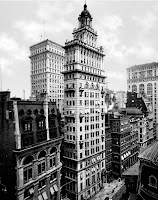 Gillender Building was the first skyscraper wrecked to make way for a taller skyscraper. But it was not the last one. For instance, Singer Building, a 47-story office building completed in 1908, was demolished in 1960 and 1 Liberty plaza with 60 floors was built. 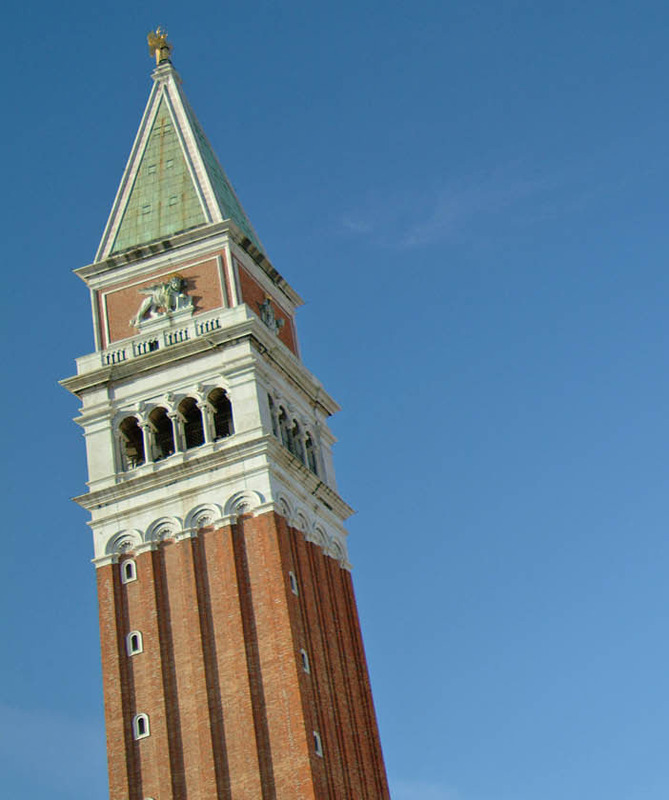 Architects took St Mark's Campanile (the bell tower of St Mark's Basilica in Venice) as a base for the design. Many skyscrapers took the Venetian bell-tower as a model for a modern office tower such as The Metropolitan Life Insurance Company Towerin New York. Other examples in US are the Daniels & Fisher Tower in Denver and Sather Tower, nicknamed the Campanile, on the campus of the University of California, Berkeley. 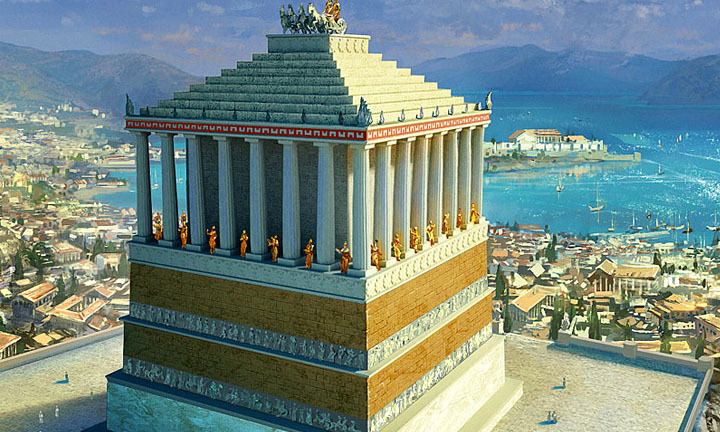 But for the architects Trowbridge & Livingston of 14 wall street it was not enough – they used Mausoleum of Halicarnassus, designed by the Greek architects between 353 and 350 BC in present Bodrum, Turkey as a model for structure on top of the tower. Mausolus was a satrap (governor) of Caria in South Asia. The word Mausoleum comes from the name of his tomb . 26 Broadway in New York is based on the model of the Mausoleum. The building on Wall street was built for the Bankers Trust headquarters . Bankers Trust was founded in 1903 and fourteen years later it became a full-service bank and one of the country's wealthiest financial institutions. 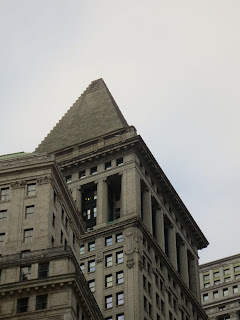 Bankers Trust adopted the pyramid at the top of the skyscraper as its trademark, and took as its slogan "A Tower of Strength". 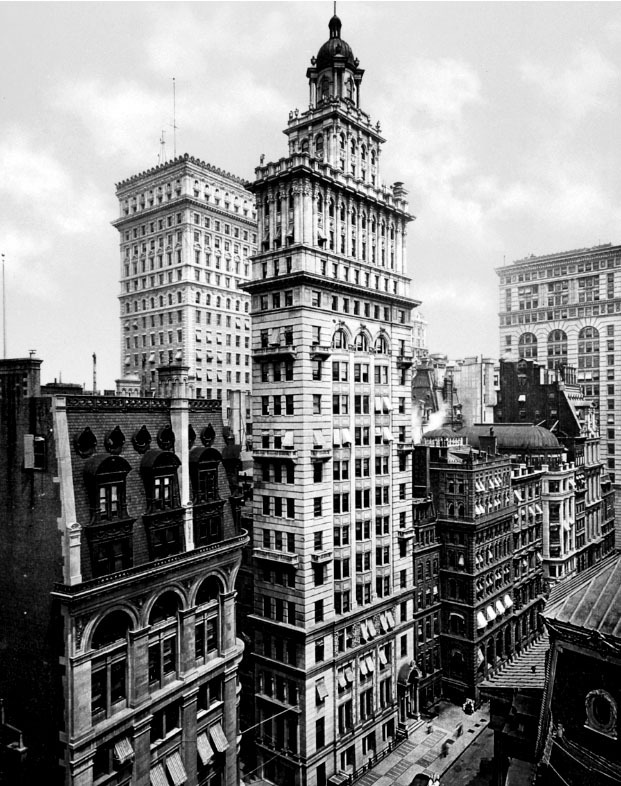 When 14 Wall Street was completed in 1912, it was the tallest bank building in the world and one of the three or four tallest buildings in the city. Over the next few decades the 14 Wall Street Building became an iconic symbol of American capitalism and the Wall Street financial district. 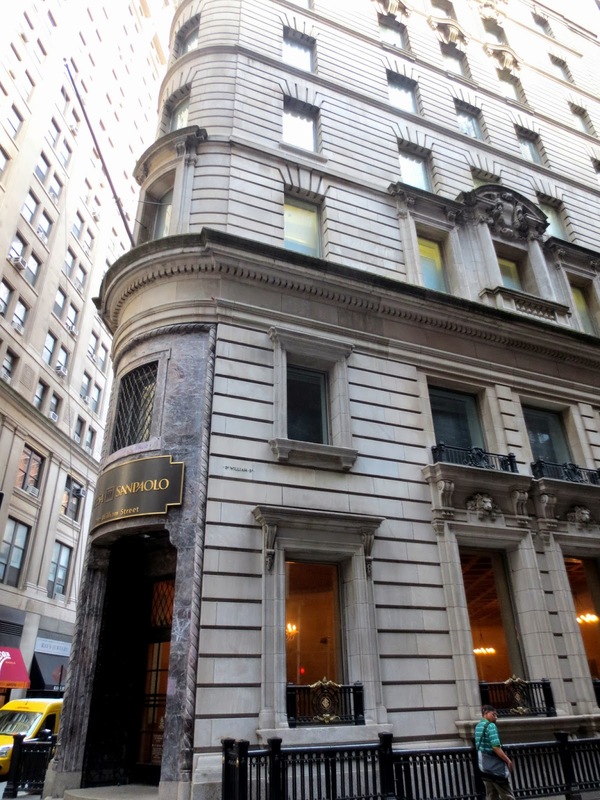 There was a J.P. Morgan's private residence on the 31st floor 1911 to 1913. Later penthouse was converted into an upscale French restaurant called "The 14 Wall Street" that had panoramic views of New York Harbor and had the menu in French style. However, the restaurant was closed in April 2006. In 1935 Bankers Trust assets had reached $1 billion. 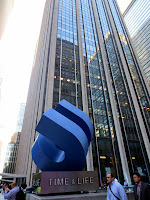 In 1961 the bank opened a second major headquarters in midtown at 280 Park Avenue. 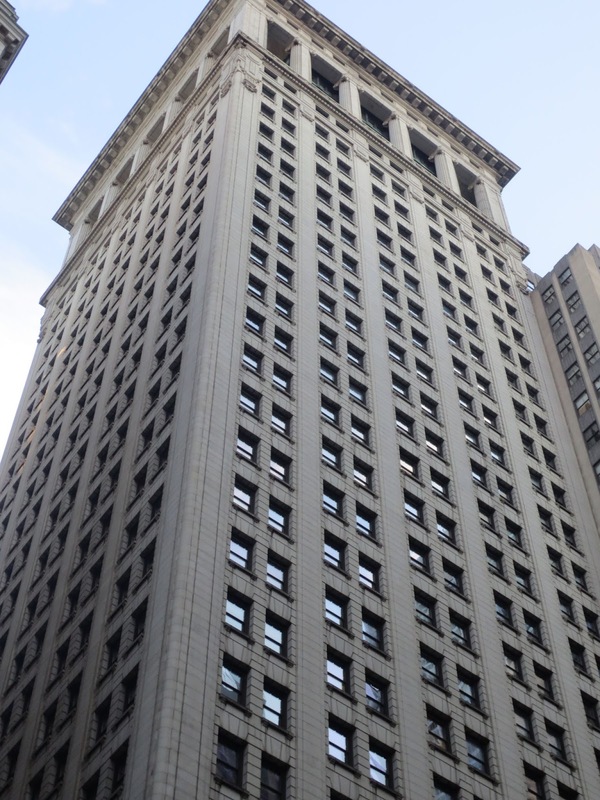 In 1987 Bankers Trust sold the building to 14 Wall Street Associates. 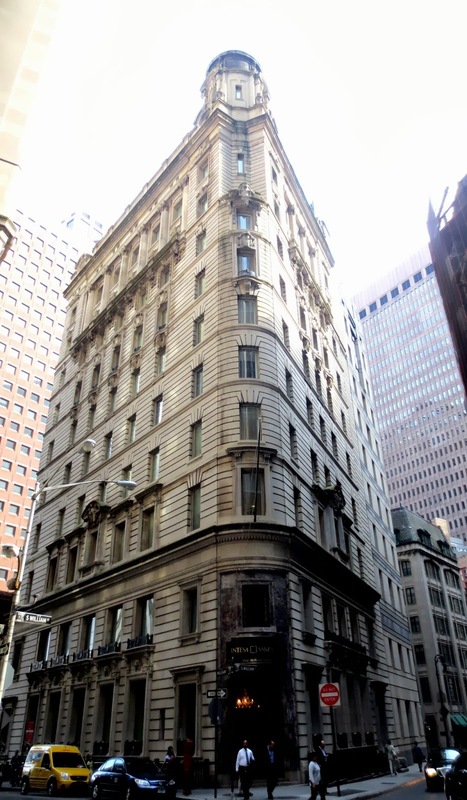 In 1991 the building passed to the 14 Wall Street Realty Corp., and in 1992 it was acquired by General Electric Investment Corporation. On January 21, 2007, the building's owners agreed to sell the property to Cushman & Wakefield. 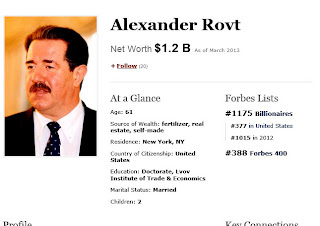 In April 2012, majority control of the 1.05 million-square-foot building was sold for $303 million in cash to Alexander Rovt, a fertilizer tycoon from Ukraine, who paid off the building's outstanding debt as part of the deal. This skyscraper is the largest building built by Rovt but not the first one! In my next post I’ll tell you more about mr. Rovt from Mukachevo! 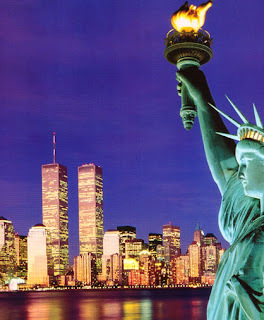 Twelve years ago on September 11 2001, the Islamic terrorist group al-Qaeda hijacked four passenger airliners. Two of the planes crashed into the North Twin and South Twin towers. Within two hours, both towers collapsed. In total, almost 3,000 people died in the attacks. I feel closely connected to this tragedy. I worked at 15 Broadway in 2001 ( just around the corner from World Trade Center and found a new job in Midtown less than a month before 9-11. I had an interview in the South tower and remember the view from the office window. My project manager left the company I had been working with two weeks after me and started his second week at the new place on one of the top floors on the South tower. His body was never found. 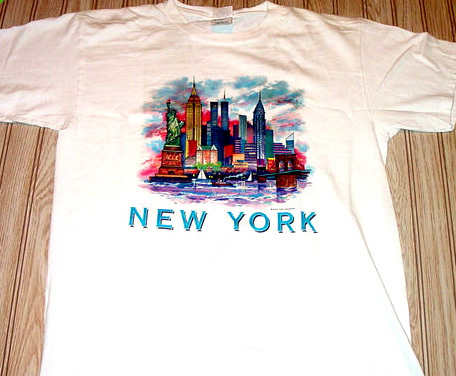 My husband worked on Water street in Downtown less than a mile from the World Trade Center. My kids had classes in college near Brooklyn Bridge at that day. They walked home crossing the East River by Brooklyn Bridge with t-shirts over their heads to protect themselves from the ash and smoke. 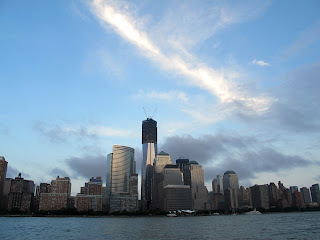 Just a week before 9-11 I looked at the New York skyline from the Staten Island ferry with my friend and was very proud to show her the beauty of it. The twin towers of the World Trade Center, built in 1970 and 1972, were more than just buildings. 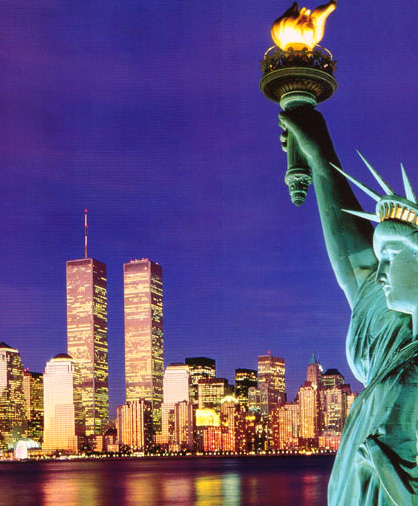 They were proof of New York's belief in itself. The complex had its own zip code, 10048. 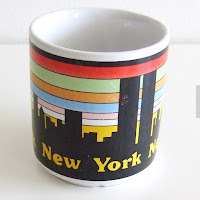 The towers became the symbol of New York – you could see Twins everywhere – on posters and mugs, t-shirts , refrigerator magnets and place mats. 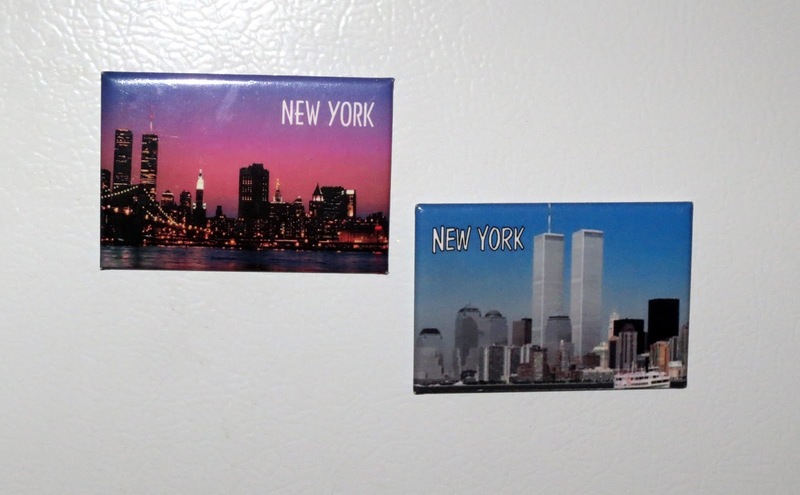 I have magnets on my fridge at home. 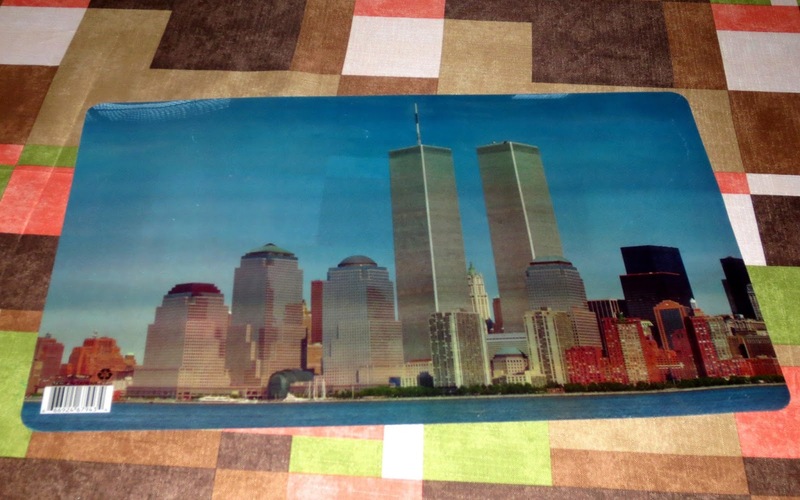 I put the place mats in the closet and keep them as a piece of a history. In February 1993 terrorists drove a truck packed with 1,100 lbs of explosives into the basement parking garage at the World Trade Center. The blast left a crater 22 ft wide and five stories deep. Six people were killed and 1,000 injured. In less than a month the towers were repaired and cleaned. 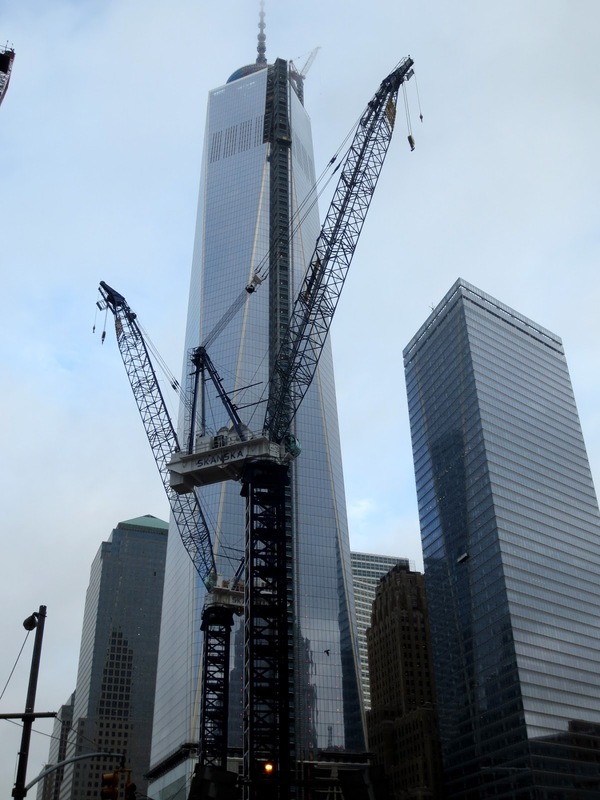 It took 9 months to clean the site of the World Trade Center after 9/11 and in 2002 the Ground Zero was ready for rebuilding. The “Ground Zero” was a was military slang and was used describing the Manhattan Project and the bombing of Japan. Reporters from different media companies almost simultaneously used this term just several hours after the towers collapsed . It took nearly a year and a half for the city to even decide upon a rebuilding plan. 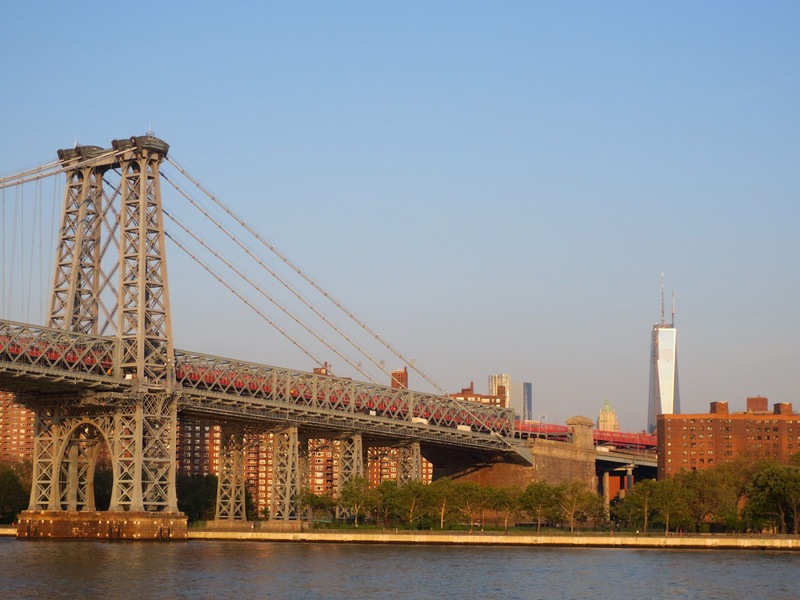 In July 2002, the Lower Manhattan Development Corp. (LMDC) — the agency that oversees the World Trade Center's redevelopment — released six proposals for how to rebuild the site. For the most famous construction site in the U.S., the plans showed surprisingly little creativity. The LMDC tried again. An international competition was held, and in February 2003, a Polish-American architect named Daniel Libeskind was awarded the project for designing a very tall, asymmetrical skyscraper. The off-center spire on the top of the building had to mirror the Statue of Liberty's torch and was aligned with the sun so that no shadow would be cast on the anniversary of the attacks. Libeskind was a dreamer and did not have experience building skyscrapers. Developer Larry Silverstein, who signed the lease to the World Trade Center site six week before 9-11, was in charge of the rebuilding . Silverstein was born in Bedford-Stuyvesant, in Brooklyn in 1931 into a Jewish family. He graduated from New York University in 1952 and attended classes at Brooklyn Law School. Silverstein has said on interviews that he usually spent his mornings in breakfast meetings at Windows on the World on top of the World Trade Center North Tower. However on the morning of 9-11 he had a medical appointment with his doctor. Silverstein brought on another architect, David Childs, with whom he had worked before. 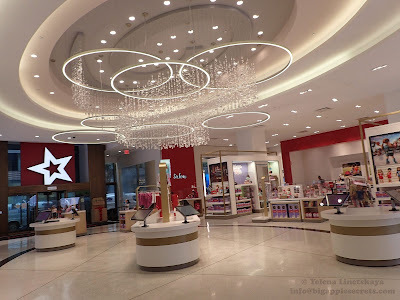 He and Governor Pataki asked the two architects to work together. 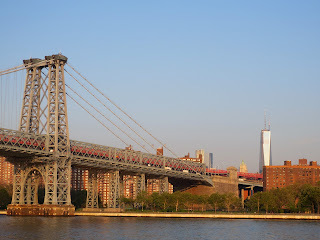 More than a year later in July 2004 New York governor Pataki, New Jersey governor McGreevey, and New York City mayor Bloomberg laid the cornerstone for the new building. 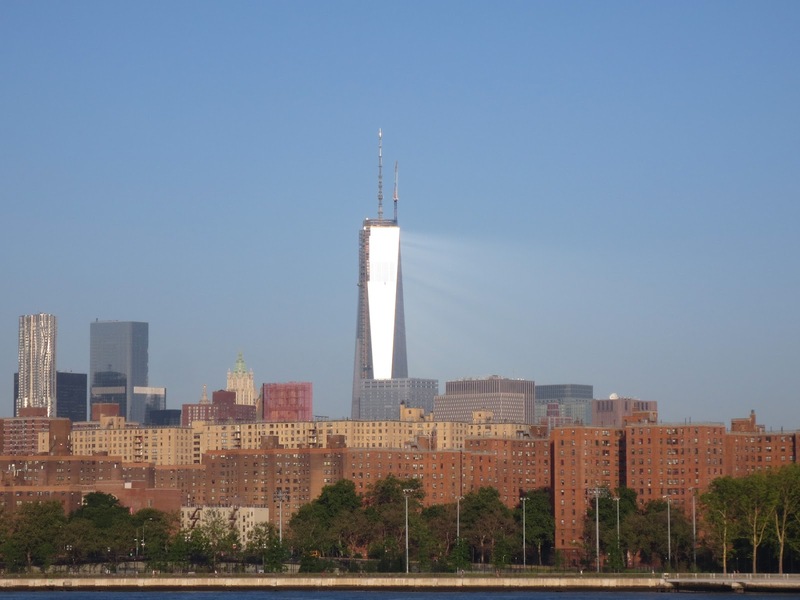 Governor of New York George Pataki stated in 2003 that, "The Freedom Tower isn't going to be One World Trade Center, it's going to be the Freedom Tower”. The architects clashed for many years. The New York Police Department, fearful of another attack on the future skyscraper, rejected the first version of David Childs design. Tens of millions of dollars were lost, and the tower’s first 20 stories were turned into a concrete bunker. 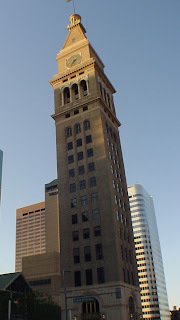 The tower was moved further back from the street. Construction was delayed for another year. The new plans were released on June 29, 2005. Things were moving slowly, and the 2008 financial crisis didn't help. 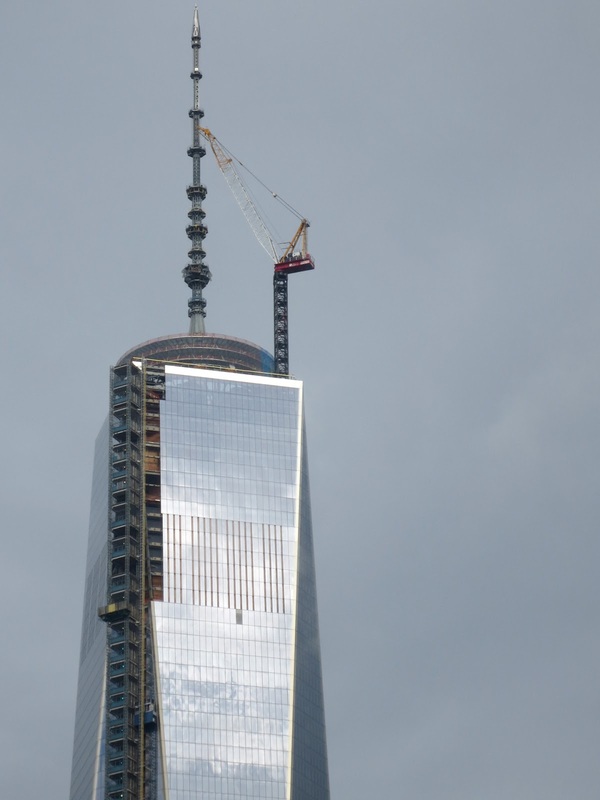 To speed things along, Silverstein turned the Freedom Tower's construction over to the Port Authority in 2008. In 2008, the project was estimated to cost $11 billion to complete. The latest projection (as of July 2013) pegs the total bill to run close to $15 billion. On March 30, 2009, the Port Authority of New York and New Jersey confirmed that the building would be known by its legal name, One World Trade Center. 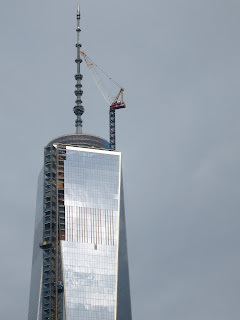 Installation of a silver spire atop New York's new One World Trade Center skyscraper was completed on August 30, 2012. Its spire reaches a symbolic height of 1,776 (1776 is the year of the United States Declaration of Independence ) feet (541 m). The tower became the tallest building in New York City and the tallest building in the Western Hemisphere. A three-level observation deck called One World Observatory will open in 2015, fourteen years after 9-11. The original Twin towers were built in five and a half years forty years ago. It took five years to construct Rockefeller center during the Great Depression. And it took only one year and 45 days to build 102 floors of The Empire State Building more than 80 years ago. 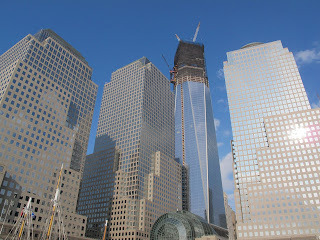 Twelve years passed since 9-11 and the rebuild of the Ground Zero is not complete yet. What a shame! 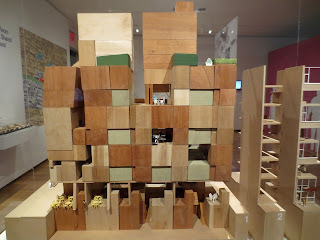 “Making Room: New Models for Housing New Yorkers” exhibit opened at the Museum of the City of New York in the beginning if this year. 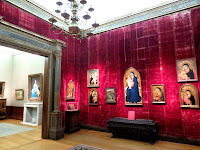 The exhibition was such a success that it was extended to September 15th due to popular demand. The median sales price for homes in New York NY is now $1,165,000 with average price per square foot $1,323. 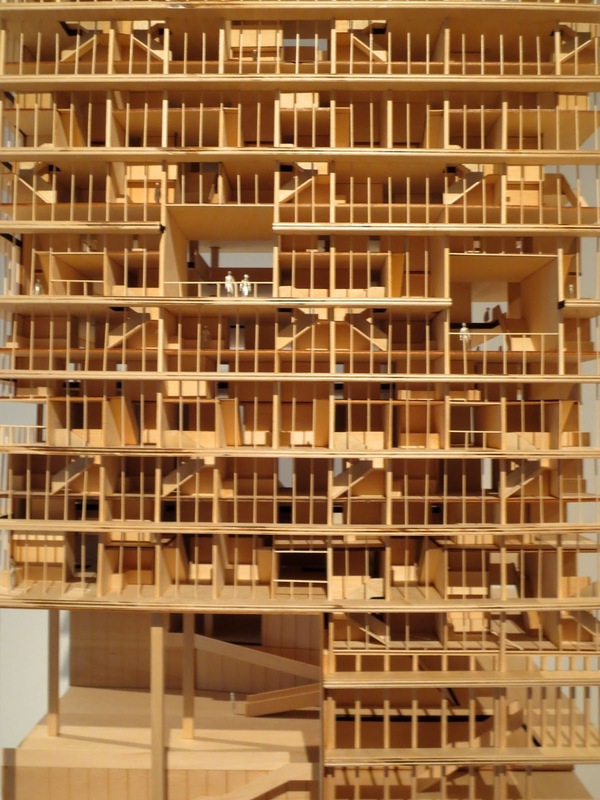 So if you do the math, the average size of the apartment is 880 square feet. Since 1987, New York City has required that new apartments be a minimum of 400 square feet. 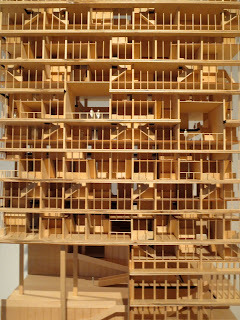 Before that regulation there were apartment complexes that were built mostly for the small families. I wrote about one of such complexes ‘Tudor city’ in one of my posts. 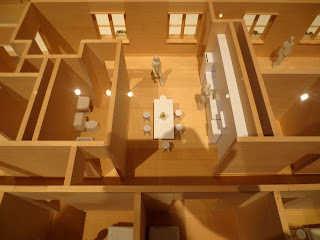 Because regulations discourage the development of small apartments it is almost impossible to buy a studio in a good location. If you are young and alone, ask yourself - what do prefer – long commute and suburban big house with several bedrooms and bathrooms or a small flat in the middle of the city? At the moment, New York City has 1.8 million one and two-person households, but only has one million studios and one-bedroom apartments. 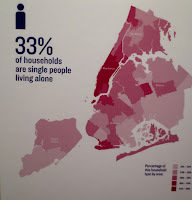 33 percent of New-Yorkers are single people who live alone, 15 percent are couples with no kids. For young, single professionals in cities like New York, San Francisco, Seattle and Chicago, where rents are high, micro-apartments are gaining popularity as an affordable way to live in a city’s most desirable location. Studios and one-bedrooms are in perennially short supply in New York. 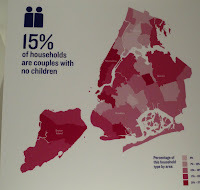 It is projected that 600,000 "new" New Yorkers, many of them single young professionals, will move to the city by 2030. 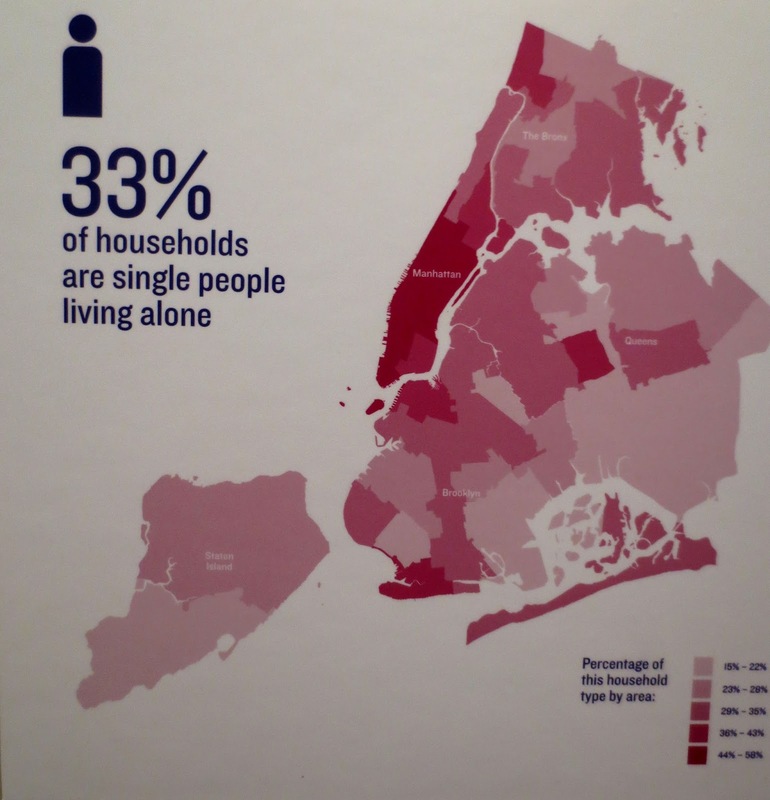 Last year Mayor Bloomberg launched a contest for developers to design a small, efficient space for single people in Manhattan . In January 2013 he announced the winner of the competition. The exhibit "Making Room: New Models for Housing New Yorkers" in The Museum of the City of New York features designs that were submitted to this competition. 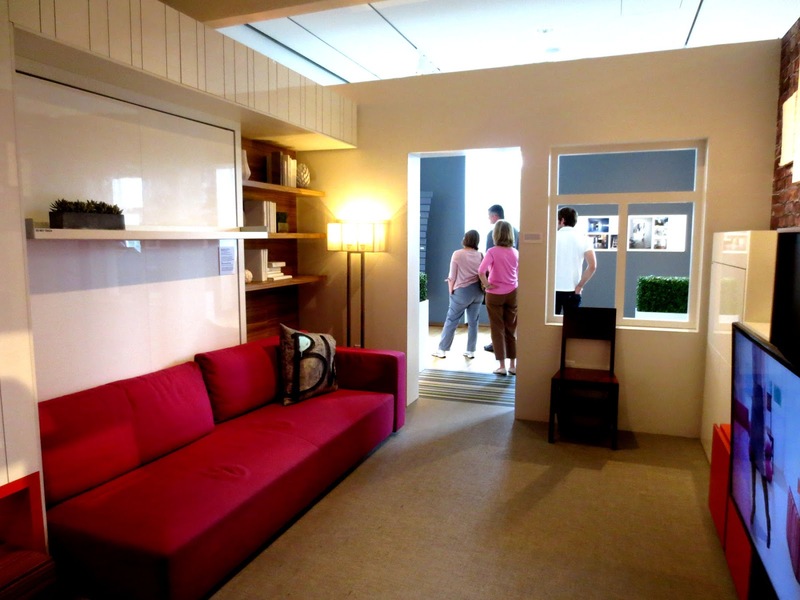 There is a fully built 325-square-foot micro-unit inside the Museum of the City of New York to demonstrate how to live in a small space. 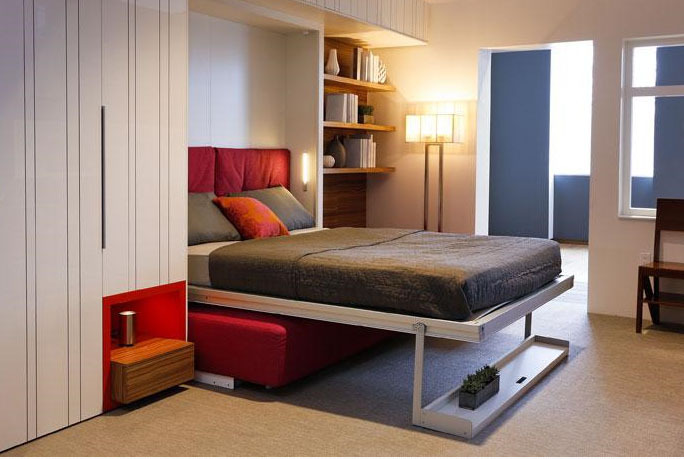 There’s a bed that vanishes into the wall, an ottoman that converts into a coffee table with four seats, a pull-out rolling dining table. 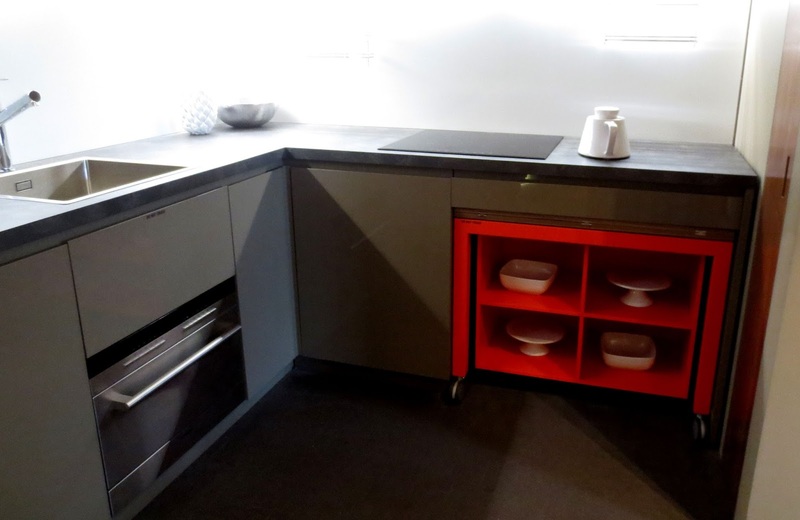 There is a refrigerator and separate freezer underneath the counter and even the dishwasher. The space storage is everywhere - there is even a glass-shelf bar behind flat TV on the wall. Five real people demonstrated how to live in close quarters as a single person or as a couple -cooking, organizing, decorating and even throwing a dinner party. 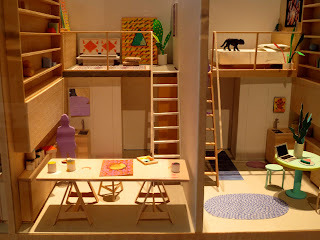 Also on display are videos and models of tiny apartments from around the world, including Hong Kong and Japan, where micro-living has been a necessity for generations. A group of Developers that win the content will be building a 55-unit apartment building in Manhattan’s Kips Bay neighborhood ( between East 23rd Street and East 34th Street extending from Lexington Avenue to the East River) on land they bought from the city at reduced cost. The city has waived zoning regulations at the site, allowing the construction of apartments ranging from 250 to 370 square feet, with ample common spaces throughout the building.